Eight second-grade students from local elementary schools visited the Virginia Institute of Marine Science (VIMS) last week to learn about the link between a healthy Chesapeake Bay and the seafood they eat with Virginia’s First Lady Dorothy McAuliffe and Virginia Executive Mansion Chef Ed Gross. Created by VIMS scientist Dr. Kirk Havens, the event—A Healthy Bay for Healthy Kids—allows young students the opportunity to learn the importance of keeping the Bay healthy in order to have fresh, sustainably harvested Virginia seafood for the table, and how that contributes to a healthy diet. The hands-on event also enables the students to prepare and enjoy a tasty seafood lunch with the First Lady and their parents. This year’s dish featured a Virginia blue crab and cabbage coleslaw wrapped in lettuce. Havens—Director of the Coastal Watershed Program at VIMS—and fellow VIMS scientists David Stanhope and Kory Angstadt, kicked off the event with an overview of blue crabs and their importance to Virginia’s seafood industry. The trio even had some live crabs for the students to see up-close, and the students were particularly fascinated with one that happened to be molting during the event. The second graders—Finley Rogers and Carmine McDaniel of Richneck Elementary in Newport News, Kenlee Washington and Pete F. of Yorktown Elementary in Yorktown, Addyson Griffiths and Zelda Luck of Achilles Elementary in Gloucester, and Peyton Marderosian and Lexi Stanhope of Abingdon Elementary in Gloucester—admit they aren’t seasoned chefs, but a few said they enjoy whipping up dishes such as panini and pepper stew. While their culinary skills have yet to reach their full potential, all of the students were eager to lend a helping hand when it came time to start cooking under the guidance of Chef Gross. 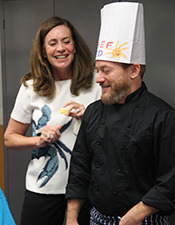 The students—each wearing their own personalized chef’s hat and apron—got to know McAuliffe a little better while Gross assembled the ingredients for the dish. As Chair of the Commonwealth Council on Bridging the Nutritional Divide, the First Lady talked to the students about the number of young children in Virginia who suffer from hunger and don’t know where their next meal is coming from, and why healthy eating is such a passion of hers. As Gross began the demonstration, McAuliffe continued to explain the importance of the Bay not only to our health, but also to Virginia’s history and economy. Kim Huskey, Executive Director of the Virginia Seafood Council, was also on-hand to explain the art of picking a crab to get the delicious meat Chef Gross had displayed in front of them. McAuliffe went on to explain some of the elements of crabmeat that make it so healthy, like Omega-3 fatty acids and vitamin B12. While the students weren’t terribly enthusiastic about some of the other healthy ingredients, like the lettuce and cabbage, they perked right up when Gross taught them how to concoct the yogurt and honey dressing. McAuliffe and Gross explained some of the benefits of buying Virginia-grown ingredients, and told the students about the garden Gross manages at the Governor’s mansion. After taking turns mixing the ingredients and wrapping the crab coleslaw in lettuce wraps, all of the students were eager to try their delicious, fresh, and healthy creation. 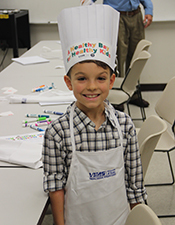 VIMS Director of Outreach Susan Maples-Luellen organized the event and says each student received a copy of the blue crab coleslaw recipe in addition to a VIMS apron and their decorative chef hats. First Lady McAuliffe also left with a VIMS apron decorated with the names of each student participant. Maples-Luellen says the blue crab and cabbage coleslaw recipe, along with a short video from the event, will be available on the VIMS website so when the students tell their classmates about their day at VIMS, they too can find the recipe and everyone can have the opportunity to enjoy Chef Gross’ delicious crab dish. 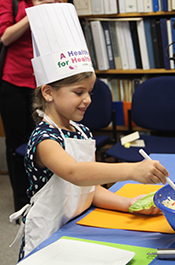 This event marks the fourth Healthy Bay for Healthy Kids at VIMS. The last event was held in 2012 with former First Lady Maureen McDonnell. The second event was attended by First Lady Anne Holton, and the inaugural event with First Lady Lisa Collis.